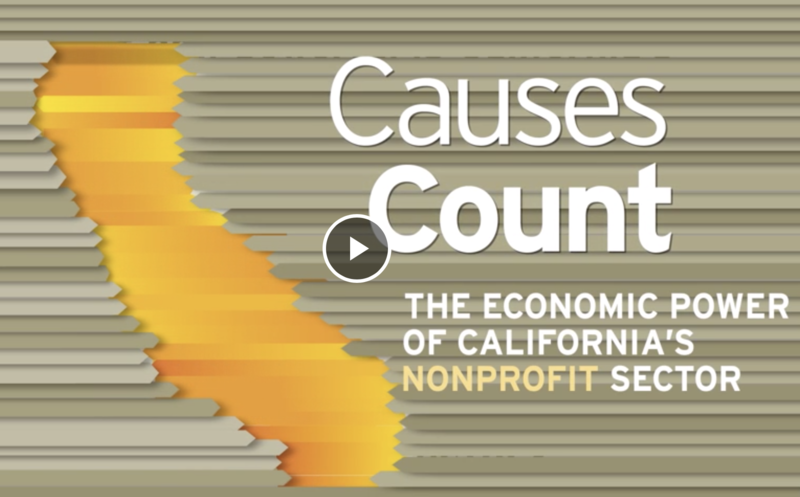 Causes Count is the first report of its kind to examine the nonprofit sector’s scope, activities and economic impact in the state of California. 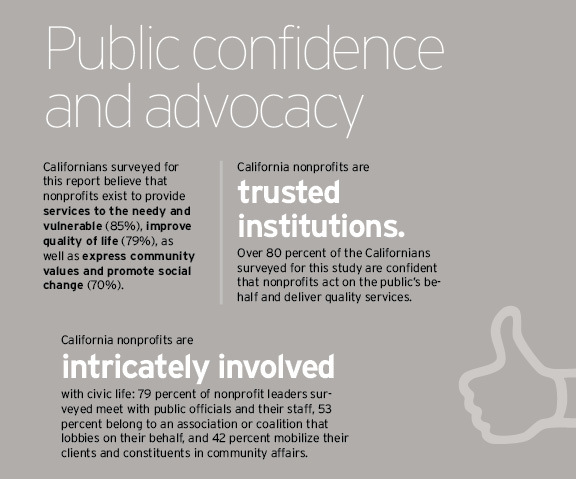 While some regional research about nonprofits has been conducted, the present state of knowledge about the California nonprofit sector as a whole is extremely limited at best. Our study addressed this deficiency, and gives the nonprofit community the information it needs to advance its cause. "Congratulations on publishing such a powerful report. Every nonprofit leader should read it right now. Maybe this will help California nonprofits to seize their rightful destiny as the amazing force that they are." "Terrific job! Your use of infographics to convey lots of dense information is terrific. I cannot remember the last time I found a voluminous report like this one compelling reading, but you did it. Congratulations." "I commend CalNonprofits for undertaking a project of this magnitude: the first-ever statewide study of the California nonprofit sector and its economic impact." This is one of the best laid out reports I've ever seen. Full of valuable information in easy to read visuals. 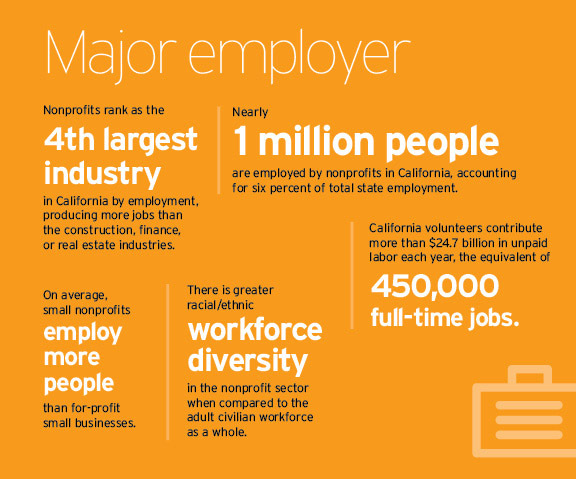 I had no idea more than a million people were employed by the nonprofit sector in California. Why don't they all vote?? I work at a small nonprofit and this really showed me that we all matter - our efforts all add up, even if its not so apparent on a daily basis. Thank you for this big-picture perspective! Your report “Causes Count” is outstanding! Good work, good research, good writing. Thank you for your efforts. Now this is something really important to share! 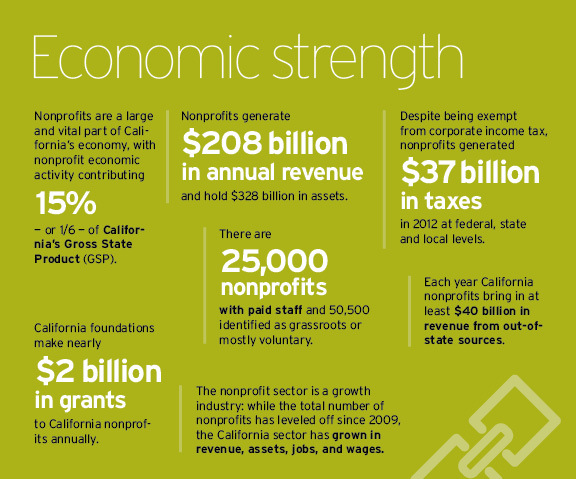 #nonprofits are so important to our wonderful state of California. I'm already fascinated by the results and I just started reading. This is better than any other economic impact report I’ve ever seen. Our board really needs to see it! I just finished a first read of Causes Count and couldn't wait to say how impressive and useful I found it. It is a beautiful, important work and I plan to publicize it every way I can. 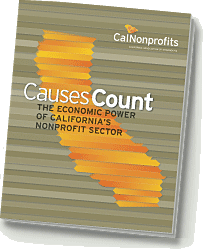 A "must own a copy" report for all California based nonprofit leaders, fundraisers and planners. 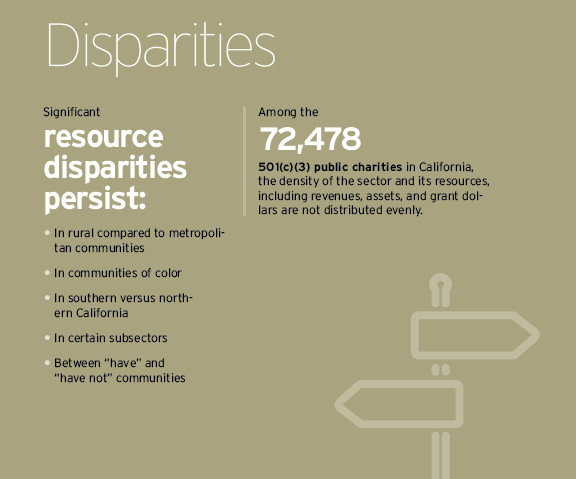 CalNonprofits has raised the bar on defining sector demographics with this easy to read and understand report. One hopes other states will follow and eventually there will be a national report that educates everyone about the role of the not for profit sector. Congratulations to Jan Masaoka and the leadership of CalNonprofits. I LOVE, LOVE, LOVE the Causes Count report. Great data and smartly packaged. Well done. I'm proud to be a California nonprofit today! I am part way through reading the report and I have to tell you – I am impressed!!! You hit a home run starting with your wise words about the important roles nonprofits play… love that you brought Downton Abbey, Nature, and environmental causes into the fold. It’s a great way of showing that our field isn’t just focused on one type of person or class. Congratulations to you and the team of authors and researchers who put it together! You have taken a drab subject and made the facts and analyses jump out in an exciting and very easy to read and understand format. This will be a major resource for California nonprofits for years to come, and a great model for others in the country to replicate. BRAVO!! What an incredible, comprehensive and well-written study!! Fantastic. What are the 10 regions and when will you release them? Just read the Causes Count report – wow! Congratulations on publishing such a powerful report. Every nonprofit leader should read it right now. Maybe this will help CA Non profits to seize their rightful destiny as the amazing force that they are. I’m sending it to all my clients. Thanks for all your great work. You’ve really turned Cal Nonprofits into an awesome organization. I’m proud to be a member. Terrific job! Your use of infographics to convey lots of dense information is terrific. I cannot remember the last time I found a voluminous report like this one compelling reading, but you did it. Congratulations . Please let the entire team know that you all did an OUTSTANDING job with yesterdays gathering. I was just amazed. The report rocked, the dialogue roared, and your all tore it UP. I'm such a proud member of CalNonprofits!! !! Loved the video and the report!!! Congratulations !! !